You are here: Home › Calendar › Pride Photo! Show Your Support! Come to the Photo! 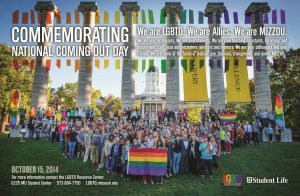 Join Mizzou for our Annual photo to commemorate National Coming Out Day during our Pride photo events. LGBTQ and Ally Tigers line up to show our campus we are One Mizzou and we support all Tigers! Truman the Tiger will join us for the photo, and will be on the Quad early for individual and group shots. Bring your friends. Make Mizzou your own. We are proud of ourselves, our friends, our roommates, our classmates, our professors, our colleagues, our campus. Pictured is 2014’s photo. To see all 19 previous photos, visit our lounge in G225 MU Student Center.